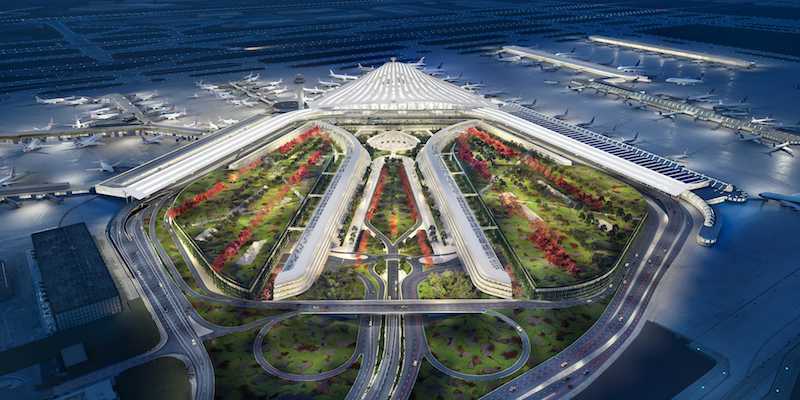 Sometime in the next few months, the City of Chicago will announce the winner, from five high-profile finalists, of a design competition for the $8.5 billion expansion of O’Hare International Airport. The expansion’s centerpiece is a new global terminal that combines international and domestic flights within a single 2.25-million-sf building that replaces the antiquated Terminal 2, and makes connections easier for passengers coming into Terminals 1 and 3 (United’s and American Airlines’ hubs, respectively). The city has kept the identities of the judges on its Evaluation Committee secret except to say that they consist of “a diverse group … who are stakeholders and subject-matter experts.” The City’s Department of Aviation also solicited public input about the finalists’ design proposals that, during a weeklong feedback period in late January, drew more than 40,000 comments from Chicago residents, travelers, and airport partners. During its daily crunch periods, O’Hare, like most big U.S. airports, becomes an amalgam of ant colony and cattle car. Chicago’s plans to expand O’Hare are in motion as the airport is coming off of a record-breaking year in 2018, when it topped 900,000 total flight operations for the first time since 2007, according to the Federal Aviation Administration. O’Hare handled over 83.4 million passengers last year—ranking it first in the nation—and 1.87 metric tons of cargo. Since 2001, O’Hare Airport, through its ongoing Modernization Program, has increased its capacity by about 50% with new runways and a modern new airfield layout. The global terminal expansion, along with two new satellite terminals, would increase O’Hare’s total terminal space by nearly 62% to 8.8 million sf upon completion in 2028. “Our investments [which include $400 million for improvements at Midway Airport] will keep passengers connected … and fuel opportunities for the City and the region for years to come,” says Chicago Mayor Rahm Emanuel, who leaves office later this year. 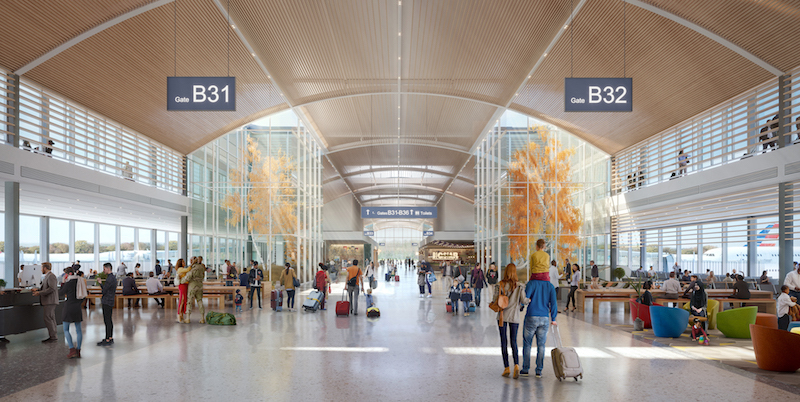 This team, led by Colorado-based Fentress Architects, has been together 25 years, and has designed iconic airports in Denver and South Korea. 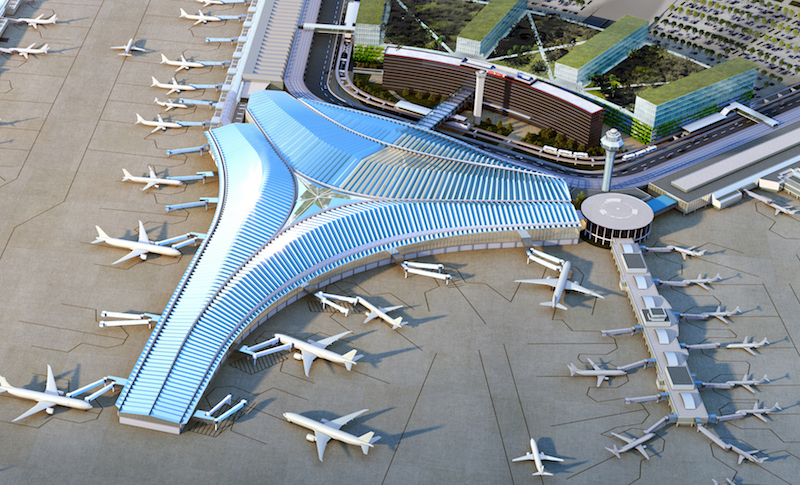 Its design for O'Hare “is a new invention for Chicago,” says Curtis Fentress, FAIA, RIBA, Principal in charge of design. 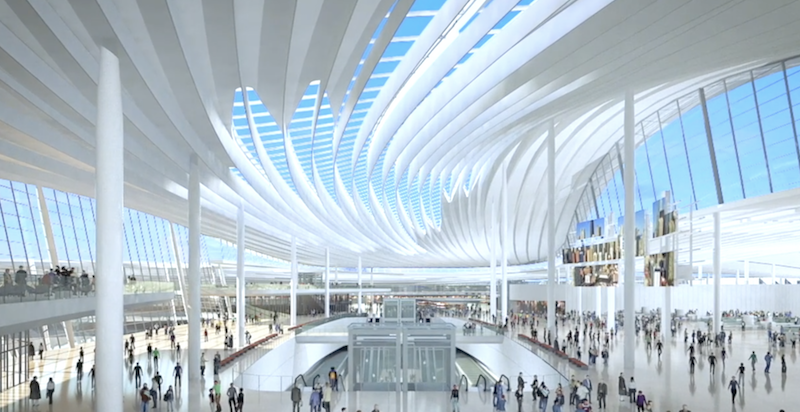 His team waxes nostalgic when it describes its vision “to return the romance of air travel to all who pass through Chicago’s O’Hare.” Its terminal features skylit roofs and soaring glass walls, and relies on daylight and layout to guide passengers “intuitively and purposefully.” Interactive digital media will also play a major role in this terminal's Great Hall space, says Fentress. 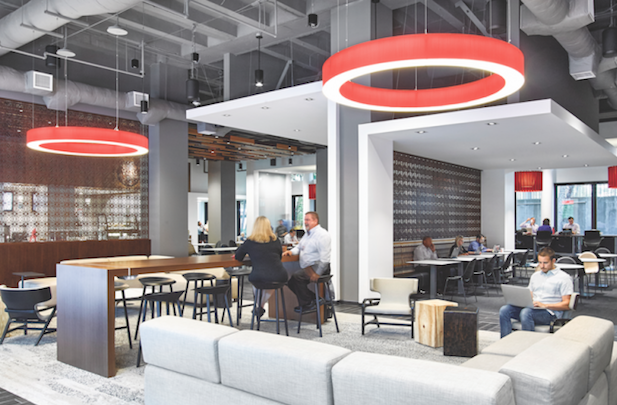 The goal of this design is to “elevate” passengers by providing them with a “seamless, comfortable, and unencumbered experience,” abetted by technology. This design team, which includes local firms Epstein and JGMA, is led by Foster + Partners, whose founder and Executive Chairman Norman Foster says the O’Hare project awakens two of his passions: flying (he’s been a pilot for over 40 years) and “my love affair with cities.” Three sweeping canopies at the entrance greet passengers as they walk into a terminal with a single, curved and column-free space flooded with natural light. 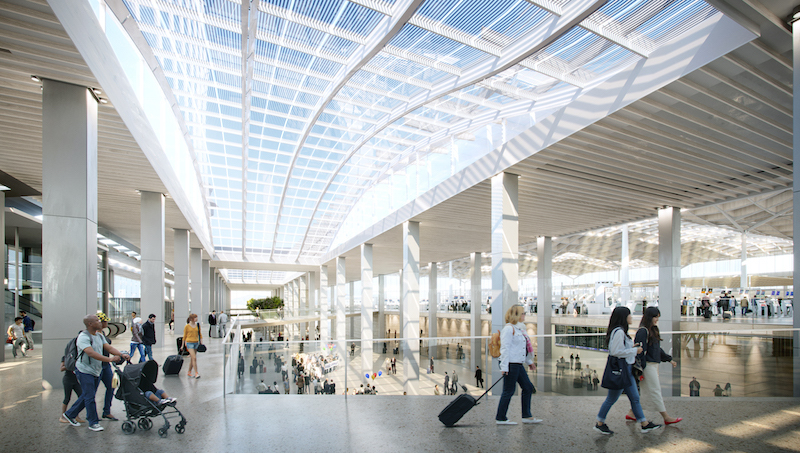 The roof structure, spanning 550 ft, is supported on its perimeter at just six points, creating “a grand unified space.” Domestic and international arrivals and departures are “intelligently planned with direct routes,” states the design team, which is working with Dorchester Industries to provide the terminal with a curated arts program. 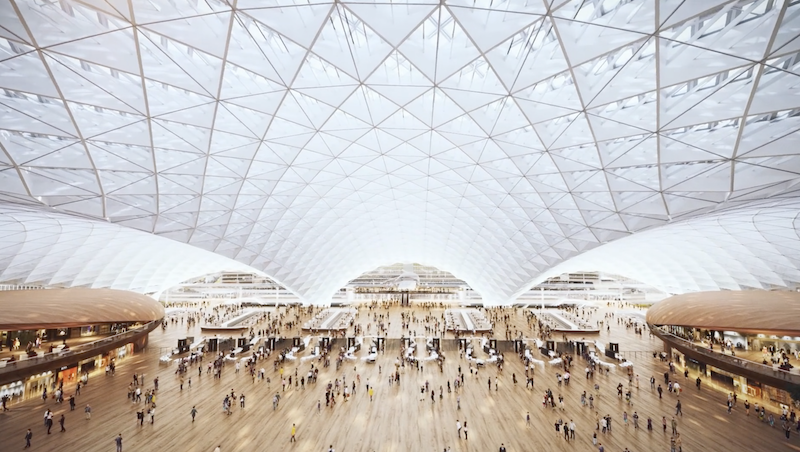 The design purports to answer the question “How can we reduce the stress of air travel?,” says Duncan, SOM’s Design Lead. The images that SOM presented with its proposal show tree-lined waiting areas, one of which with a hammock slung from tree trunks. 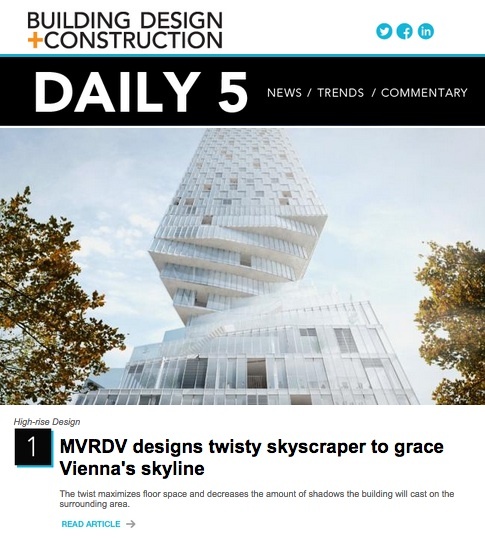 This design includes enclosed and open-air children’s spaces, personal cabins, interactive digital media, an outdoor garden, and artists’ works. Upon entering the terminal, passengers are welcomed by a soaring, double-height gathering space, where clear sight lines lead through check-in and security. 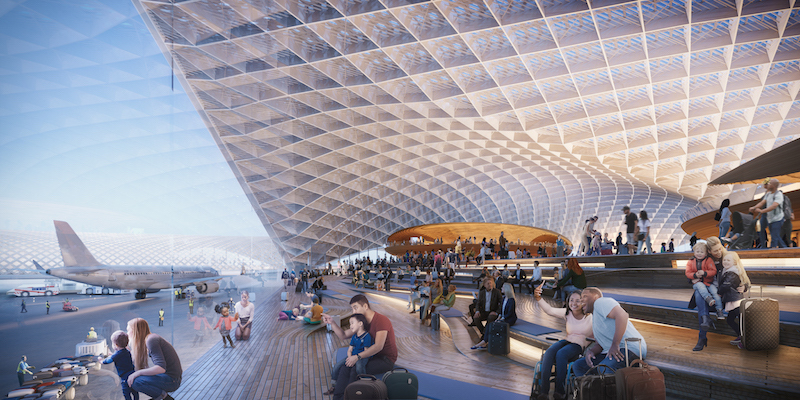 The check-in, security, and baggage claim halls are under a single, undulating, lattice-like long-span roof punctuated by skylights and supported by tree-like columns, recalling the airport site’s history as an orchard. To either side of the check-in hall, visitors can pause in a landscaped prairie replete with local Illinois plants and grasses. International passengers will have views of the Chicago skyline before entering the baggage claim hall, under the same ceiling as departing passengers. 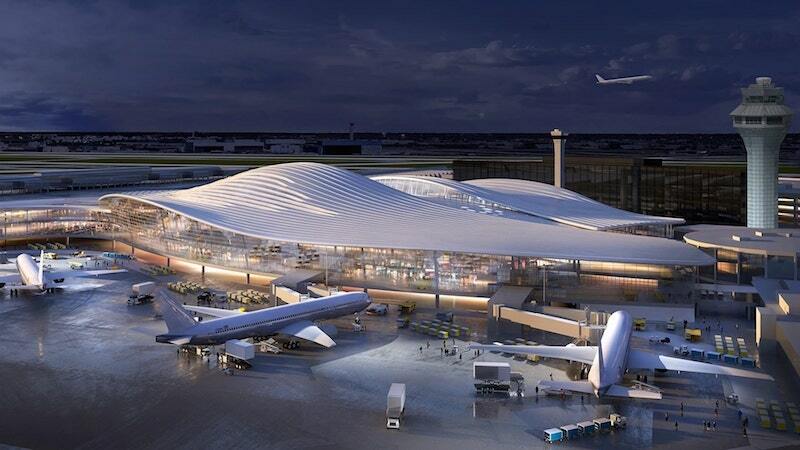 This team’s design is distinguished by, among other things, its shell-like white roof, its 67,000 sf of interior green space, and the terminal’s triangular shape, “which is a dramatic change for airport design,” says Pat Askew, Principal, Senior Vice President, and Global Director of Aviation for HKS Architects, which is part of the Calatrava team along with Burns McDonnell. 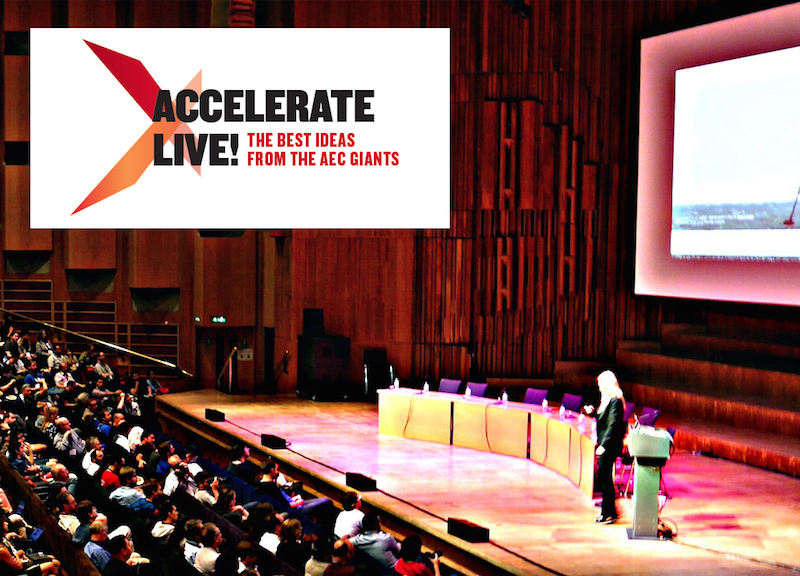 Last week, Askew and Kate Nigl, HKS’s National Aviation Business Development Director, spoke with BD+C about their team’s proposal. 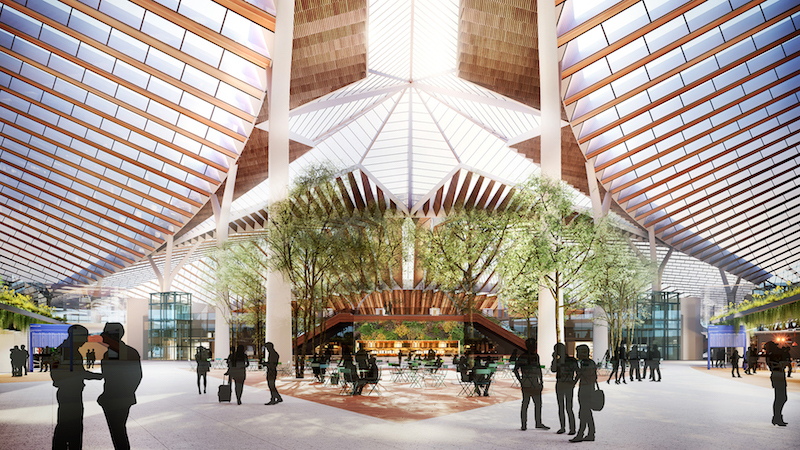 The terminal this team envisions bears a number of Calatrava’s signature flourishes, not the least being its vaulted, column-less, light-filled interior space. But Askew and Nigl also emphasize “the way we’ve organized the site” with a “vision of central access” that allows passengers to more-easily orient themselves. 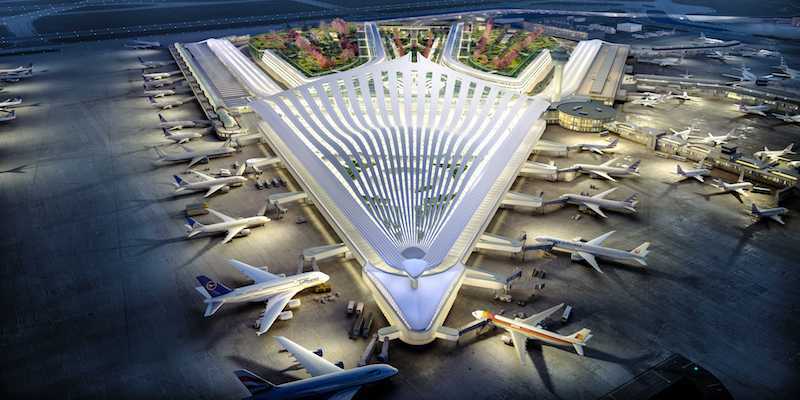 For example, once passengers get through T2’s security, they would enter an open area with an indoor garden that leads to people movers, to be located at the center of the building, that in the future will connect all three terminals to the satellite concourses. From their vantage, passengers would be able to see the entire airport: its retail stores, lounges, and gates. 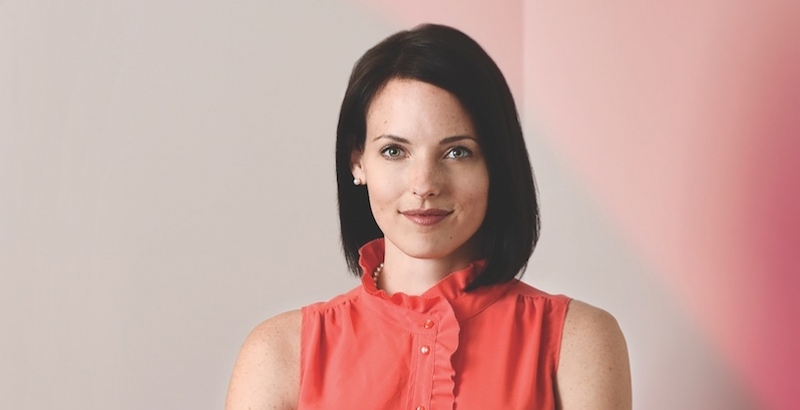 “Going through security is one of the stressful parts of flying, and this is meant to alleviate stress and make passengers more comfortable,” says Nigl. 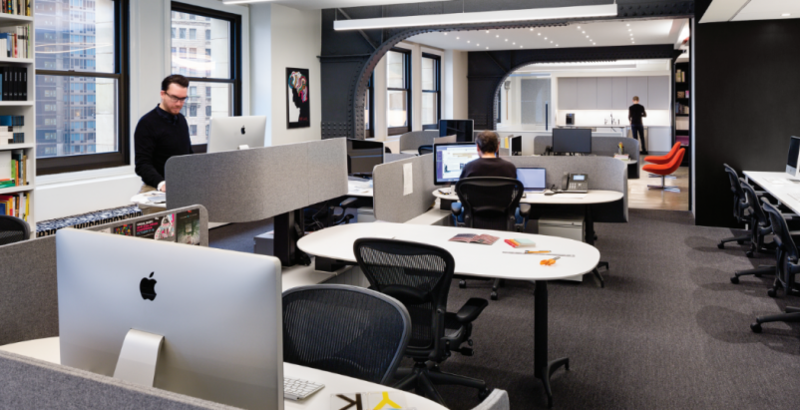 The security area itself would be a vast, open segment of the terminal that can be partitioned or reconfigured as demand dictates. Askew notes this area anticipates advances in passenger- and bag-screening technology that eventually becomes less intrusive. The global terminal would be linked to other terminals on the landside by the existing Airport Transit System that would incorporate a new Consolidated Rental Car facility; and inside, past security, to two new satellite concourses by people movers going through an underground tunnel. When asked about the city’s 2028 deadline for O’Hare’s expansion, Nigl says “it’s ambitious, but doable.” Askew adds his team’s design “would actually be quite easy to do,” using prefabricated components hauled onto the site, thereby minimizing the need for a large construction area. The materials could be brought in from the facility’s land side, which means workers wouldn’t have to go through security every time they enter or exit the site. 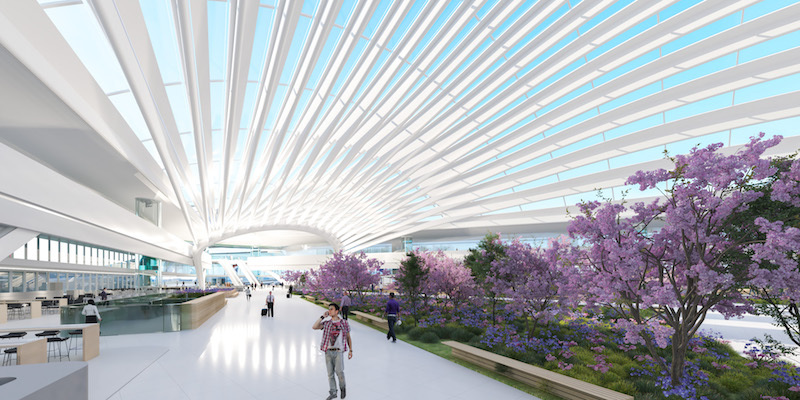 Outside of what it presented for the design competition, the Calatrava team proposed remaking the parking area in the front of the new terminal into a large green space, “an airport city in the gardens,” framed by the roads leading to the airport. Askew and Nigl are quick to point out that this concept is simply “an option,” and would not eliminate parking. On the contrary, below the trees would be parking garages with green roofs and even more spaces for cars. This option envisions a new train station and two hotels.